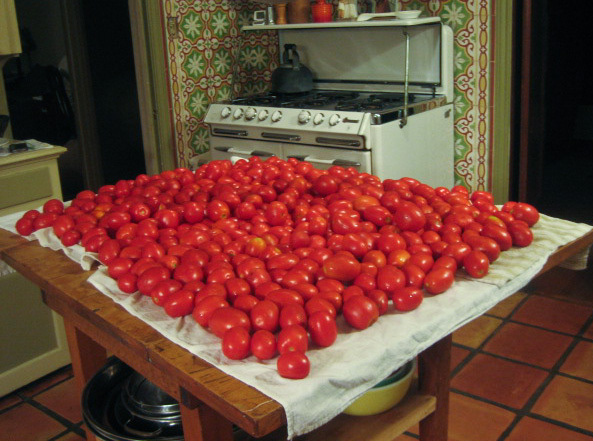 What do you do with 60 lbs of tomatoes? The first time it happened was a few weeks ago. Somewhere between pasta and clarinet practice, a time usually reserved for homework, I found Andrew on Facebook at the desktop and watching some video on a laptop, while listening to music with his headphones plugged into an Ipod. He looked like one of the plugged in pod people from The Matrix. I stood at his bedroom door and called his name. No response. I called louder. Again, no response. I walked over to him, knocked softly (sort of) on the hard plastic of his headphones and suddenly he was three feet off the chair trying out some preternaturally installed Kung Fu move to protect him from my stealth invasion. He thought that was pretty funny until I asked him about his homework. “I’m doing my homework!” came his curt reply. When I said that the first time it happened was a few weeks ago, this was not what I was referring to. This super plugged in version of homework has been an ongoing battle that started with the first Ipod birthday present and has increased exponentially with his ever-increasing media access and fervent march through puberty and into the teens. He was, in fact, doing his homework. He had his vocabulary cards out and was alternating between cards, laptop video, facebook, and constantly changing music choices. I went into my staid lecture about the evils of multitasking and he assured me that the new generation was wired differently. I assured him that his generation wasn’t that special and still shared many of the same traits with humanity that teenagers always had. I confirmed my place in the family and told him to unplug or else. That’s when it happened for the first time. He called me a name. The truth is that I can’t even remember what he called me now. It wasn’t obscene. It was disrespectful and mean. He lost his laptop and headphones. He also got an A on his vocabulary test. The second time happened about a week ago. I was at the finish line cheering him on as he came in from the three-mile cross-country race. After crossing the line, he passed me and demanded water. I didn’t have any (water was waiting for him 50 feet away) and he yelled at me for not being prepared. A few minutes later, he tried to explain to me in the midst of all the parents and team members why he had to be so rude. I told him we would talk about it later and suddenly a demon rose up from the depths of his soul. “You’re pathetic!” he shouted for all to hear. All eyes were suddenly on me and I chose to leave this for later. Later came and so did a day of angry teenager. Facebook access was the casualty in the battle. I told him that if he couldn’t communicate with me properly that he couldn’t communicate with anyone. The third time was just a few days ago. He already had dinner and some media downtime. It was time for homework, clarinet, and dishes. He was back on the computer begging for just five more minutes. Five minutes later I returned to his lair. This time he was not so cordial. Once again, I “just didn’t’ get it”. He was special with special powers of multitasking that I didn’t understand. “It’s my homework! It’s my life! It’s my decision when I do it!” he screamed as he opened up his math book and got out his pencil and notebook. He couldn’t let it go though. Now, no matter what I tried to say, I got the redundant litany stating the obvious. Of course I am a control freak. It’s synonymous with parent. At least to the teenage mind it is. I should have kept my cool, but every speech I had ever learned at my parents knees about respect and rudeness came flying out of me loud enough to send the dogs scurrying and the neighbors to contemplate 911. Heated exchanges, slammed doors, lifetime punishments, and then silence. No homework, no clarinet, and no dishes. I had parented Andrew right out of doing everything he should have done. I also managed to shut him down so tightly that he was left with few options. He chose to a cover his head and sleep at 7:30 pm. I was fuming and angry that I was alone to deal with this. I called my mom. Without thinking, I asked her to talk to Andrew. I thought hearing his grandmother’s voice would get him to suddenly mature, apologize, and do his homework. I put her on speakerphone and she said all the “right things” about family, respect, and listening to your parents. I don’t know if he was listening, but what she said next was heard loud and clear. “If you think you can find a dad who loves you more or a home where you will be happier, then you should go try to find it!” I know what she meant and I had heard the line countless times in my childhood during my own bouts of teenageritis, but Andrew had been waiting for this shoe to drop for almost six years. I saw it in his face. It was an expression of utter shock and disillusionment. I quickly stopped my mother from going on and told her that wasn’t an option in our family. Suddenly I couldn’t breath. I watched in horror, as six years of trust building seemed to be ripped right out of our relationship. I had never felt this kind of emotional pain since Andrew had become my son. Oh, we have had our ups and downs, but this was different. Andrew was weeping in his bed. I was short of breath and the tears were just about to flow. I had to hang up with my mom. She was crying too. She called my sister and soon the emotional tsunami had swept across three states and promised to drown anyone who came near. I had no idea how to handle this and as I went and sat next to Andrew, he let me hold him and we just had a good weep. I told him that there was nothing he could ever do to lose my love. I told him that since he had become my son, he had changed my life and every moment of every minute, every minute of every hour, and every hour of each day was for him. I was his dad and thanked God for the miracles that brought us together. There was nothing else to do but go to bed. Sleep wasn’t going to come easy. The next morning, Andrew was still a mess. He begged me to let him stay home. Principal dad said “no”, but Andrew’s dad saw that he needed time to figure this out. I also saw that he was worried about going to class without any of his work done. It would be the first time since he started high school to not be fully prepared. I acquiesced and laid out a game plan that included calling grandma. When I got home later that day, I was greeting by a light hearted son who immediately asked me to sit me down and told me how sorry he was for calling me names. He told me he had practiced clarinet for almost two hours, did his homework, studied for an up coming test, and yes… he had called grandma and they had a good talk. I looked at him and knew I had something to say. I was glad that he recognized that his behavior had played a major role in last night’s events, but it wasn’t the whole story. “I know, Grandma told me!” I was also glad to hear him call her grandma. It was a rare moment. He was completely unplugged and listening. I promised to try hard to not resort to yelling and he promised to not resort to name-calling. I knew that we still had to tackle the issue of unplugging for homework, but now was not the time. Andrew has many more teen moments to share with me, but I hope I’m prepared to be the more mature half of this relationship when they come up. Yesterday, we finally talked about how to manage the media and he came up with a good plan that we both can live with. He actually took it farther that I would have had the courage to ask for. Patience and calm always win the day. Always. Permission granted to show this photo only if I explain he was having a bad hair day! Actually, it was a bad hair month. I often post recipes that I know most people will look at and think, “I can’t imagine ever doing this!” or, “Where does he find the time to do this?” At least, I know my sister is always thinking that! However, this blog is about slowing down long enough to reflect on the small moments of life. Slow cooking and slow parenting go hand in hand. 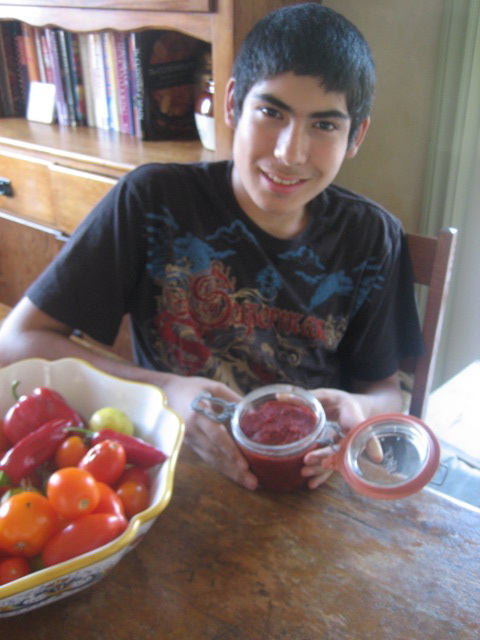 Spending time with your kids preserving food will teach them lessons about family values quicker than any lecture and then you get to eat your words in a way that feels good! Andrew loves this process. Well, at least he loves watching me go through the process. If you have kids, this is the kind of slow cooking that captures their imagination. Andrew carefully observed the time it took and tried to calculate how much I could sell a jar for. He came up with “not cheap.” Actually, this product is so good that you won’t even want to share it with close family and friends. 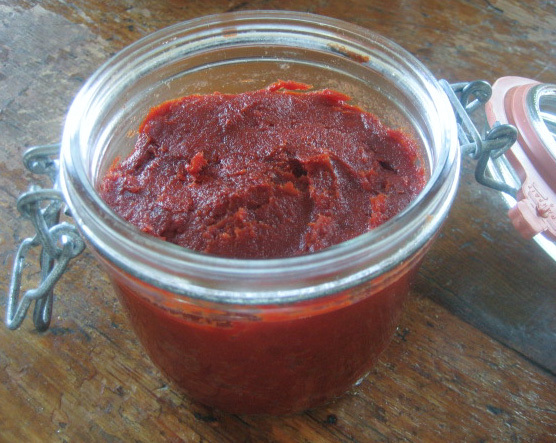 Homemade tomato paste is deep, rich, and with an earthy sweetness that you will never experience in a store-bought product. There is absolutely no resemblance to the tinny stuff that comes in a can. Use it to deepen the flavor base of stews and braises all winter long. Because it’s in a jar and not a can, you will also be able to pull out a spoonful of the exact amount you need and never have to figure out what to do with the rest of the can that you didn’t use. You will need a food mill to get this right, but if you are at all like me, then a good excuse to buy a new piece of kitchen equipment is always welcome. This recipe is well worth the effort and the small price for a new piece of kitchen gadgetry. I promise you will enjoy both products for a long time. Trust me. Make this paste. You will thank me later. 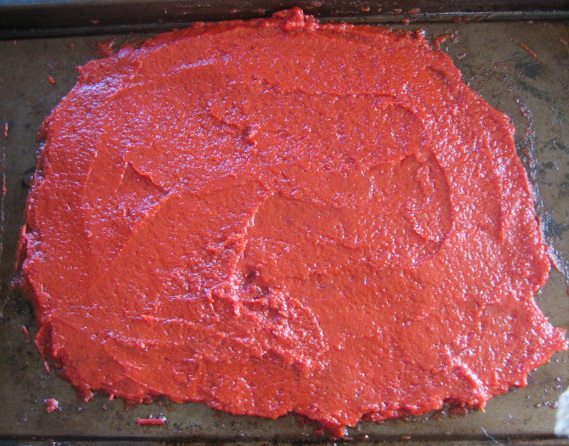 There are many recipes out there in cyberspace for homemade tomato paste, but I have settled on one in a favorite cookbook “My Calabria” by Rosetta Constantino. I find that her recipe produces a consistently excellent product. Don’t be afraid of the salt content. She uses an enormous amount of salt that acts as a strong preservative and flavor enhancer. This gives you big dividends from a small amount of paste and allows you to make this magic potion last throughout the winter. I have doubled the recipe and suggest that you do this in large amounts. This will give you about two pints of paste. Core the tomatoes and cut them in half or quarters depending on the size. Over your sink, remove the seeds with your fingers and through them into a very large pot. The size of your pot will determine whether you do 20 pounds or 10. A large enameled canning pot works well for large batches and an 8-quart stainless steel pot works for 10 pounds. Bring to a boil and give the pot an occasional stir. 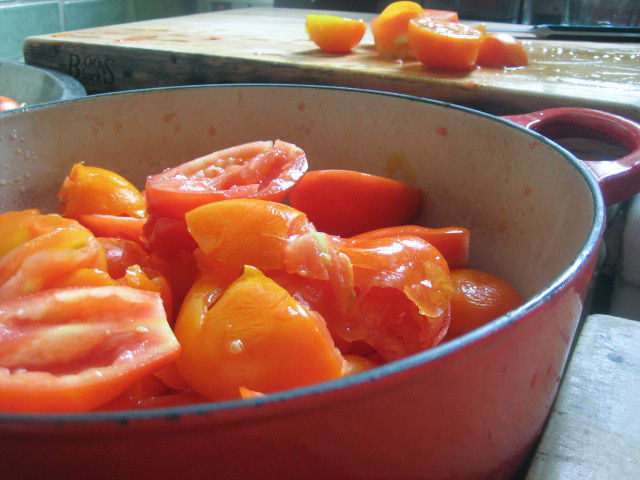 Keep at a brisk boil for 30 minutes to soften the tomatoes. Pass the tomatoes through a food mill fitted with the fine disc to remove the skins and any remaining seeds. This takes a bit of time and arm power. If you have a significant other or kids, this is a good time to enlist their help. Return the pureed tomatoes to the same pot and place on high, stir in the salt and simmer briskly until the mixture is reduced to 1 quart (4 cups). This takes approximately 50 to 55 minutes. As the mixture reduces, start to reduce the level of heat and stir occasionally to prevent splattering and burning. When I get close to this time, I will pour it into my 4-cup measure and see how much further I have to go. Use a tablespoon each to oil two 12 x 17-inch rimmed non-aluminum baking sheets. Using a rubber spatula, spread the thick tomato puree in an even layer. It will cover the baking sheet. Ms. Constantino says that you need three to four consecutive days of 100 degrees weather for this method. In West Los Angeles, that is a rare occurrence. I have found that 75 to 80 degrees works fine. With one batch on a particularly hot day, I found that too much sun turned the paste almost gummy. You will need to tent the mixture with cheesecloth and check occasionally. As the mixture evaporates, you will remix it and spread it again. Each time it will cover a smaller proportion of the baking sheet. The whole process will take 3 to 4 days. Alternatively, you can start it out with the oven method and finish it off in the sun. Preheat the oven to 200 degrees and (if you have one) turn on the convection fan. I do not and it works fine. Place the baking sheet on a center rack and cook for 30 minutes. Remove the baking sheet from the oven and stir the puree with a rubber spatula so that it dries evenly and doesn’t form a crust. 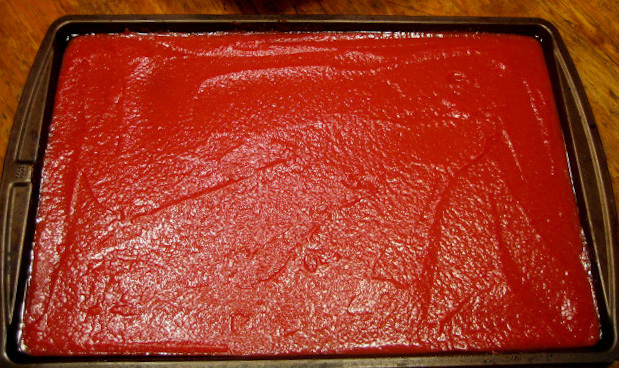 Re-spread the puree with the spatula into a rectangle about 1/8-inch thick. Take care to spread it evenly as too thin of a section can burn. 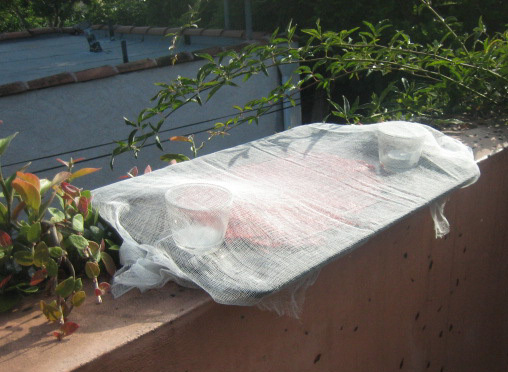 Because of evaporation, the puree will no longer cover the baking sheet. With a paper towel, remove any bits of tomato that cling to the edges or exposed bottom of the baking sheet, or they will burn. Return the baking sheet to the oven and every 20 minutes or so, stir and re-spread the mixture. Do this for approximately 3 hours or until the mixture is very thick and a bit sticky. 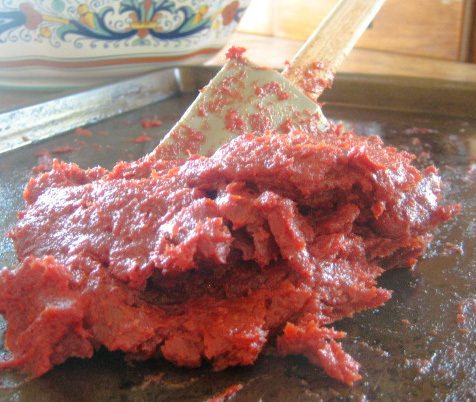 Let the tomato paste cool and pack tightly into a clean jar. You have to work this a bit to ensure no air pockets exist as this will ensure a long shelf life. Level the surface with the back of a spoon and top off with enough olive oil to cover and ensure the paste is covered. Just a little bit of olive oil on top and you're finished! After each use, level the surface of the paste and top with a bit more oil to keep it completely covered. This will last for a year in your refrigerator, but it will be long gone before that! Each and every lesson and recipe you share are told with such care. I adore each one and look forward to them! As a foodie they make me hungry, as a parent, they connect us all. I will tell you that children at this age must test a parent with this kind of emotion , often ,as a teen to understand that we will never let go. For a parent, we could never and I do mean never, send them off to college in a few years if we didn’t have these moments. They teach a lesson that bond us forever. But, if we only have the warm ,soft moments with them as children, we would never let them go. Not ever! My lovely daughter did not talk to me for her entire junior year of high school. This was tough , I did everything I could to figure it out ……. now I know ( she is 31) that it was our first detachment that had to come for growth and her learning to live without me! We are best friends now, and I wish someone would have told me just how normal it was! Nothing better…. children and food !!! Lovely story, really. But, where was this recipe when I had 100 lbs. of heirlooms from my garden a month ago?